Start by baking a batch of your favorite cupcakes. I've included the recipe for these chocolate sour cream cupcakes that I made. I like this recipe because the cupcakes bake up flat rather than domed, creating a nice surface for the roses. The topping is a simple cream cheese frosting. It will take under 10 minutes to make. To achieve the beautiful 2 tone effect, you will need 2 batches, one plain and one tinted with Wilton icing color paste in rose. Take a pastry bag fitted with a 1M pastry tip. 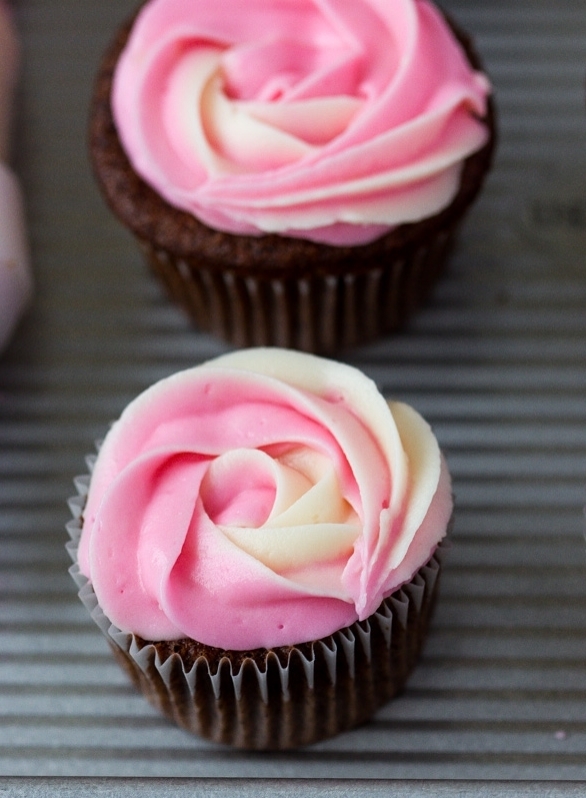 Line the bag with half of the plain frosting and half of the rose, lengthwise. it doesn't need to be perfect. It'll work just fine. Twist the bag closed and pipe a little of the frosting onto a plate or piece of parchment paper until you see both colors flowing out of the bag. Holding the cupcake in your left hand, and the pastry bag in your right ( if you're right handed), begin by placing the pastry tip in the center of the cupcake and squeeze, lifting up slightly. Continue adding light pressure to the pastry bag, moving your tip clockwise, making a large swirl around the cupcake. Go around once or twice, depending on the size of your cupcake, in one continuous motion. And there you have it, a lovely rose. These cupcakes are perfect for Valentine's Day, wedding showers, luncheons, you name it. I think they're perfect anytime. Preheat the oven to 350F. Place liners into 2 cupcake pans. Set the chocolate over simmering water in a heatproof bowl. Stir until melted, then set aside to cool slightly. In a large bowl of an electric mixer using the paddle attachment, beat the sugar and butter together until creamy, about 2 minutes. Add the melted chocolate on low speed. Turn the mixer up to medium and add the eggs, one at a time, mixing well after each addition. Add the vanilla and mix in the sour cream until no streaks show. On low speed, add half the flour mixture, mixing only to incorporate it. Add the water, and then the remainder of the flour. Fill the cupcake liners with about 2 generous tablespoons of batter. Bake for about 20 minutes. In the large bowl of an electric mixer on low speed, beat the butter, cream cheese, and vanilla together until completely smooth. Add the powdered sugar, mixing until smooth, then increase the speed to medium and continue beating for another minute or 2. Divide the frosting into 2 bowls. Using a toothpick, or the tines of a fork, add a little rose color to one of the bowls until you reach the desired shade. Fill a large pastry bag fitted with a 1D pastry tip, with half plain frosting and half rose, lengthwise. It need not be perfect. Pipe a little frosting onto parchment until the 2 colors appear. Then holding the cupcake in your left hand, and the pastry bag in your right, begin by piping into the center of the cupcake. Working clockwise, swirl the frosting around the cupcake in one continuous motion until the surface is completely covered. Depending on the size of the cupcake, you may need to circle once or twice.